Every timber home project is a unique journey. For some clients, their journey with us begins with a handful of sketches on napkins and an idea in their mind. For others, it starts with a design they have drafted with their personal architect that they want to adapt to include timber framing. For Mark and Kerri, their journey with Riverbend began when their designer, Jim Walters, came to us looking to add something special to their Michigan home. Here is their Riverbend story. Building on the banks of Elk Lake in Northern Michigan, Mark and Kerri desired a home design that not only worked with their sloping lot but was indicative of the wooded environment of their location. Introduced to the idea of incorporating timber framing by Jim, the couple was instantly attracted to the traditional look and feel of Riverbend’s timber frame homes. From there the process of working together began. 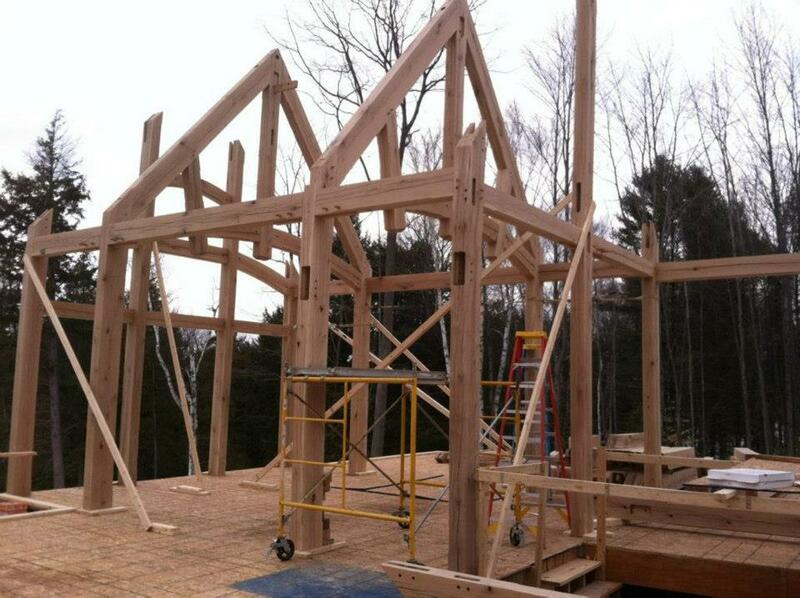 Mark and Kerri worked with Jim and Riverbend’s team to incorporate timber framing into their original home vision. Loving the look of robust timbers with simple details, the couple had Riverbend’s team adjust their ceiling heights to accommodate truss systems. By vaulting the ceilings to incorporate the timber framing, they were able to augment their great room windows to let more natural light in. The result was a one-of-a-kind 4,786 square foot modified timber frame home design. Along with the timber frame, Riverbend supplied the couple’s builder with a structural insulated panel (SIP) and insulated concrete form (ICF) solution that would fit with the home’s timbers and create a tighter, more energy efficient envelope. This integrated system was delivered to their location and was raised quickly and efficiently. Today Mark and Kerri’s unique timber frame structure sits upon its Elk Lake location and is in its next phase of construction. When this couple’s journey to their ideal home began, their vision did not include timber framing; now they couldn’t imagine their dream home without it.